If your job requires you to wear a uniform, you know how important it is to look your best. And you know that to dress to impress, you must press. With an iron, that is. Ironing out all the wrinkles on your uniform is a key part of looking put together, professional, and ready for work. But as you know, ironing can be a tedious task. So wouldn’t it be nice if you could look crisp and clean without having to iron your uniform every day? Workrite thought so, which is why it came up with an innovative way to make ironing a thing of the past. Workrite’s Perfect Press Autoclave Process is really great. It allows you to enjoy a permanently wrinkle-free uniform, with no iron necessary. It makes things easy for you. The process is much more complex, but it’s a brilliant one. The Autoclave process is multifaceted. Workrite clothing goes through several rather thorough and rather complex manufacturing processes in order to provide superior durability, low maintenance, and of course, a terrific appearance. 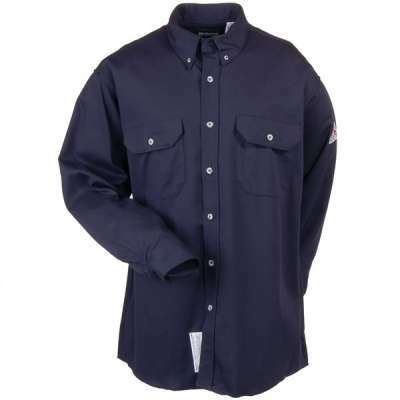 The permanent-press autoclaving technique at the center of it all is called Perfect Press, and all Workrite Nomex IIIA garments go through it. Before starting the autoclaving process, each Workrite uniform is pressed with an iron in order to lock in a crisp appearance. Then the garments are all placed on a rack, where they are checked to make sure there aren’t any wrinkles and to make sure that none of them are overlapping each other. Then the autoclave process begins. This subjects the garments to high-pressure saturated steam, which is how they become permanently wrinkle-free. Then every part of every garment is checked again. Twice. Just to be sure. What you end up with is a uniform that looks freshly pressed every time you wear it. People will think you just took it off the ironing board, but you won’t even need to own an ironing board. Wash after wash, year after year, your Workrite uniform will maintain its top-notch look, which extends its wearability time frame. And it couldn’t be easier. Simply pull it out of the washing machine, give it a shake, and put it on a hanger. No ironing is required to get that wrinkle-free look. Easy. Even after many launderings, your Workrite uniform will keep its appearance up, which means you’ll keep your appearance up. It will save you time (no ironing) and it will save you money (no buying a replacement uniform because yours has been ironed so many times it no longer looks good). It eliminates “seam puckering,” which is different threads shrinking at different rates, as well as fabric shrinking at different rates, both of which are what happens when uniforms get repeatedly ironed. Workrite’s Perfect Press process actually improves its permanent press performance over the life of the garment, in addition to permanently heat-setting those snappy-looking creases. Let Working Person’s Store help you get that wrinkle-free look, without the hassle. It’s time to ditch the iron and let PerfectPress help your uniform look perfect.